San Diego Comic Convention, which operates San Diego Comic-Con, has filed suit in federal court against the organizers of Salt Lake Comic Con, and is asserting, for the first time that we’re aware, that the way Salt Lake is using "Comic Con" is an infringement on "Comic-Con" or on "Comic Con International," at least in this case. San Diego argues that the graphic design of SLCC’s use of "Comic Con," which de-emphasizes the "Salt Lake" and emphasizes "Comic Con" is confusingly similar to San Diego’s marks. San Diego seemed especially incensed by the Salt Lake group’s activities around San Diego Comic-Con this year, when it had an Audi skinned with "Salt Lake Comic Con" (again, with the type on "Comic Con" significantly larger than the type on "Salt Lake") delivered to a hotel near the show. The hotel called the San Diego convention organizers, according to the complaint, believing that it was meant for them. 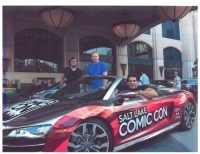 The Salt Lake group used the car around the San Diego Convention Center to promote its show, according to the complaint. San Diego also points to the Salt Lake merch, which has the large "Comic Con" and smaller "Salt Lake" design for the logo as well. The complaint also notes that the Salt Lake organizers publicized their intentions in an interview with Expoweb (now part of Folio), in which Bryan Brandenburg was quoted as saying, "We knew that the term ‘comic con’ is kind of like a Xerox, it’s a generic brand. All it means is comic convention, but we knew that there was brand equity associated with the phrase that we could capitalize on, being the only comic con in our market." The Expoweb article also says, "The core audience would be served by leveraging the name and experience associated with other giant comic cons, including the industry’s mega show, Comic Con International, but Brandenburg wanted to cast a wider net." San Diego requests a judgment, damages, triple damages for willful conduct, fees, costs, interest, and an injunction against the use of its mark or actions "likely to cause" confusion about San Diego’s association with the Salt Lake show. "Our position is that the phrases ‘comic con,’ ‘comicon’ and even ‘comic-con’ are generic and are abbreviations for the term ‘comic convention.’ This has been a common expression since 1964, 6 years before San Diego Comic-Con even existed. When used with another set of words such as ‘Salt Lake,’ ‘Big Apple,’ ‘Chicago’ or ‘New York’ they become a name that has protection and exclusivity. Lawyers may have "questioned" the validity of San Diego’s trademarks, as the Salt Lake group asserts, but it has them, and the time for objection has passed. The trademarks include "Comic-Con," "Comic Con International," and the graphic design for its logo. San Diego has also filed for a mark for "Anaheim Comic-Con" recently; that mark is not incontestable like the others. The Anaheim mark is presumably for the show it has been running as Wonder Con, which was originally a San Francisco-area show. This is the first time we’ve seen San Diego Comic Convention sue over its marks, although based on public actions, it appears that it has previously exerted pressure. Shows that were using the hyphenated version of Comic-Con (including Wizard World, which just reported rapidly increasing earnings, see "Wizard World Continues Swing to Profits") have suddenly stopped and rebranded with the unhyphenated version at various points in the past. But this is something different. The argument seems to be that the Salt Lake show is trying to pass itself off as associated with San Diego Comic-Con through its use of "Comic Con" with small or absent identification as being from Salt Lake City, and through other means. The Salt Lake City shows have been wildly successful in drawing attendance, if less so in driving sales for its exhibitors (see "Comic Conventions Are 'Like Going to the Mall'"). 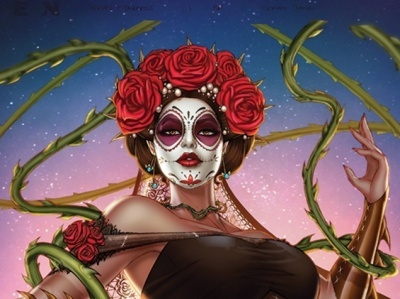 So the issue is huge, not just for San Diego Comic-Con and Salt Lake Comic Con, but for the exploding fan convention business, which has now reached $600 million in annual ticket sales (see "Fan Conventions: What's Behind the Mask"). 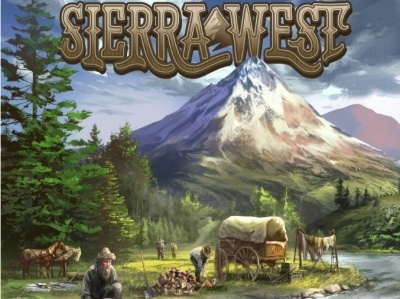 Board & Dice have revealed two summer titles: Sierra West and Teotihuacan: Late Preclassic Period. Fairy tale princesses are the heroic adventurers in Charmed and Dangerous: The Sisters Grimm.